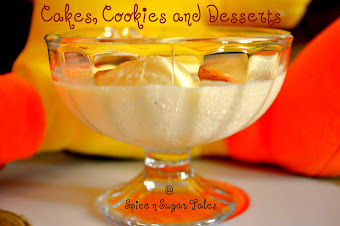 I'm back with the Round-up 2 of the event, 'Cakes Cookies and Desserts'. Without much ado, I'd like to post in the next 132 entries of the event. 193. White Chocolate Mousse with Strawberry!!! Good job on the round up! Awesome round up with yummy delicacies :-) Seems like I missed the event, I guess I joined ur space after the event was closed maybe..
well done...... Very very nice! Great roundup with wonderful dishes ! !